The piece of wood was heavy in Carl's big hand. Big Carl Mueller learned the art of killing from the master of them all. He was unbelievably big and incredibly dirty. To call him a brute would be hasty thinking. He didn’t read, or listen to music, or converse with his friends. Man can live by bread alone, and he did. That, and what his two acres would produce. He could read, a little, but not enough to make it a pleasure. He had no music to listen to and not enough personality to attract friends. He lived in a shack on the two acres, about fifty yards back from the road. The shack was in the shadow of a huge elm tree, a tree that would have furnished him with stove wood for many a winter night. Hut he hadn’t cut it down. So perhaps man can’t live by bread alone. And he liked to look at the stars. Winter and summer, he enjoyed that, though he couldn’t have told you why. He’d never been taught cleanliness, or any of the other virtues. People drove by, on the highway, but he had no contact with them, no way of knowing how they lived, or why. In winter, at Christmas, a few men would come, men who called themselves Good Fellows, and brought clothes and food, but they never stayed long. They seemed to be afraid of him, silent as he was, and dirty, and so big. It was January, a cold, windy January night that the visitor came. He was a short man, with a high forehead, with eyes that seemed to glow like the stars. He was carrying a suitcase which must have been heavy, for it dragged his shoulder down on that side. “Car? Phone?” the big man said, like a child trying out new words. “Cold,” the big man said, and gestured his visitor in. Cautiously, like a fox around a trap, the smaller man came in. The glowing eyes took in the wood stove, the candles for illumination, home-made candles, the sagging couch and bed. He wanted to show he understood about cars. Carl watched as the smaller man stretched out on the couch, arranging his overcoat around his feet and legs. Then the fiery eyes studied Carl’s face thoughtfully and the smaller man nodded, as though in satisfaction. Carl watched him until the eyes closed and the man’s breathing grew heavy and regular. Outside, the wind whined at the door, and the sides of the shack trembled slightly from time to time. No one but Carl had ever slept in this shack which he had built. After a little while, he filled the stove, checked the draft, and blew out the candles. The darkness was absolute, but he could hear the other man’s heavy breathing, and it soothed him, much as the wind soothed him. But he didn’t fall asleep for a long time. He kept thinking of those magnetic eyes, and the fervor in the small man’s voice. Surely, this was an unusual man, different from those fat and soft-faced men who’d come at Christmas. This man was like a weasel, small and quick and alert. Just before he fell asleep, a memory disturbed him; he’d seen the face before, a picture of it, at least. But he couldn’t remember where or when. When he woke in the morning, the shack was cold and he could see his breath. He could see, too, the small man standing near the front window, his lips moving, his eyes staring at nothing. He was wearing his overcoat. Carl stirred and the smaller man looked his way, and his lips stopped moving. He smiled at Carl. Carl smiled back, and threw off the covers. He crumpled paper and put it in the stove, and picked up some kindling, piling it in slowly and carefully. There was a piece of birch about two inches through the middle, too long for the stove. Carl snapped it like a match stick. The small man was at his side, now, watching. He stared as Carl put the two pieces of birch into the stove. “Strong, aren’t you?” the smaller man said. Carl frowned. He could not follow this. “Strong and yet oppressed,” the man went on, and his voice had the magic in it again. “So it was in my country. They fear the strong, those who are weak. They keep them down. I changed all that.” It was as though he were talking to himself. Carl lighted the fire and watched the first flames start to climb. He watched it, fascinated as always, and then opened the draft. The frying pan was still on the stove, the grease in it hard and ridged, flecked with black, lie watched the grease start to melt and went to the corner to get some potatoes out of the box. The smaller man seemed to bristle. “Strong, yes. In the mind, I was strong.” He tapped his forehead. “In the mouth, too,” Carl thought. The little man was right; he made strong talk. There was oatmeal for breakfast, and eggs and little pork sausages. There was coffee. There was talk. Always, with the little man, there would be talk. The Talking Man, Carl called him in his thoughts. Though he didn’t mind it. He could shut off his ears from the talk, after a while, and listen when he grew weary of looking at the fire, or the snow drifting down outside. The friend came back, after supper, just as the stars started to fill the sky. The friend was a thin, blond man, much taller than the visitor, but with something of the sameness about him, a sort of fire like his in the eyes. The friend brought magazines and newspapers and more food. His thin nose wrinkled, and he looked around the room, as though he was smelling something. They started to talk in another language then, quietly, but there was that thing in the smaller man’s voice that kept Carl from turning off his ears. That was his strength, all right, that voice. A man would believe any thing that voice told him. The voice went on, but Carl didn’t hear. He was standing by the window. The snow had stopped falling, and the air was clear as glass. The stars were bright, and so close, and all around he could see the clean white of the hills, and to the north the black trees standing sharply against the whiteness. When he went over to check the fire, Leader was reading one of the pile of papers Otto had brought. He was smiling as he read. Carl nodded as though he understood, watching the eyes and listening to the voice. He sat on his bed, his huge shoulders hunched forward, his gigantic hands interlaced. Leader’s voice went on and Carl heard the words strong and discipline and cause related often. Carl continued to nod, fascinated by the voice, not understanding exactly what all the words meant. “We will have their money?” Carl asked. “I believe you,” Carl said, and nodded, though it wasn’t anything he could digest in a short time. But this man was his friend, bringing good food and plenty of talk, not ashamed to live with Carl, this little nun he’d seen a picture of somewhere. Carl squinted a little, in the dim light, studying that pale face. They were not words Carl understood. The small man seemed to glow. Again, he tapped his forehead. Carl tried to understand, but his attention was wandering. He didn’t think Leader would like it if he went to the window again, but he wanted to see the white hills and the bright stars. He could pretend to check the stove and thus get a glimpse of the flames. He went to the stove. He bent to pick up a stick of fire wood, and remembered how his strength had pleased Leader. Smiling, he took an even larger stick and snapped it in his hands. “The strong,” he said. “We will be on top.” He displayed the broken pieces. Carl smiled and watched the flames. But he continued to think of the stars, and he could stay away no longer. He went swiftly to the window and looked out. “Someone’s coming?” Leader’s voice was sharp. Carl shook his head. “No, I wanted to look at the stars. I like to look at them.” Leader came to stand next to him, and he pointed out at the road, where the headlights were sweeping by. “To improve the race, or get the things we need, it is not wrong to kill,” the man said. He laughed, and Carl laughed, too. Carl watched the car’s headlights until Leader sat down with his papers again. Then he watched the stars, and the woods and the white, clean snow. Behind him, the fire crackled, and the pages of the newspaper rattled, and he felt secure and good. Later, when the lights were out, when there was no sound but the crack of the cold outside, and the cracking of the fire in the stove, Carl lay with his eyes open, going back over the flood of words. He could remember the ones that had been repeated often — kill, purpose, strong, money, fools. He fell asleep with the words running through his mind. The days went on, and the cold held, but Carl didn’t mind staying inside. He had Leader for company and good food and pictures in the magazines to look at. Otto the nose-wrinkler came quite often, and each time after he left, Leader would frown for a while, as though the news was bad. “Something is wrong?” Carl asked one day. “You will leave me?” Carl asked. Carl thought of the food he’d eaten these past days. That would go with leader. The stars were not as bright to Carl, thinking of the food he would be missing. He didn’t hear Leader’s monologues, remembering the steaks and chops, the white rolls and rich butter. Otto had brought chickens, already roasted, from town, and hams, and duck. One afternoon, Otto brought Leader’s car back. The cold was less and the sun bright, and Leader went out in the yard to talk to Otto. Carl sat inside, near the stove, a coldness in him as be thought of the good life he would be missing. If Leader had never come, it wouldn’t have mattered. But leader had brought food and talk to shorten the cold days, leader had stirred him to what could be, with power and money. He saw Otto and Leader shaking hands in the yard, and then Otto went to another car that was waiting on the highway, the motor running. Carl nodded, thinking of the chicken and duck. Leader pulled the suitcase out from under the bed, the suitcase he hadn’t moved through all the days. Carl was at the window, looking out at Leader’s car. Carl turned to see the suitcase open, open and crammed with money. His eyes widened. He pulled out a thin packet of bills and handed them to the big man. Carl couldn’t keep his eyes from the rows and rows of money still in the suitcase. He took the thin packet of bills and looked sadly at leader. He went over to sit on his bed. Words and pictures were moving through his mind, the pictures of food, the words the Leader’s. He put his head in his hands, thinking of the fine rich food. Carl’s mind was confused and he sought through the maze of pictures and words to find some to express what he felt. Then the vision of the food left and he kept seeing that money in the suitcase. That was food, too. The shack was getting colder, and Carl went over to put some more wood in the stove. Leader was breathing steadily and heavily, now, his eyes closed. The words came to Carl, the repeated words, The strong can do no wrong. To kill is not wrong. To improve the race, to kill for a purpose. The piece of wood was heavy in Carl’s big hand and he stared at it for seconds before he walked quietly over to the couch. The first blow was at Leader’s strength, at his forehead. The skull cracked like a walnut with the blow. Carl was still pounding long after the head and face was just a pulp … . Later, Carl tried to dig a grave for Leader, but the ground was so hard that he quit after digging a few feet. He put the suitcase in the hole, for safekeeping, and leveled the ground after burying it. Leader he carried out to the car waiting near the road, and put him in the back seat, and closed the door again. Now he would have ducks and chickens and steaks. He would tell no one about the money; it was his. He had killed for it. When the men came, later, to ask about the body of Leader in the car, Carl shrugged and lied, because lying is not wrong. 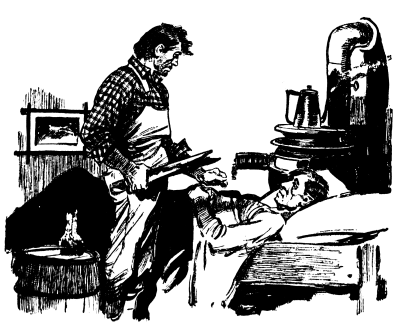 But they saw the dried blood all over his hands, and finally, in that smoky room in town, he admitted it was his work. So Leader was listed as unidentified, and properly buried in the charity graveyard, and Carl went to prison. There was no capital punishment in this state. It was a big gray building, but warm, and the food was better than Carl had known before Leader. After a while he even had a cellmate, a talkative little Irishman, and at night, through the bars, he could see the stars. It wasn’t so bad.